Thanks for your Middle-earth articles. Here’s my list of “Canonical” Peoples and their corollary “real world” culture. Did I miss any? • Bree-hobbit [=1897-era Buckinghamshire, the location of the real world “Brill/Bree-hill” and “Coombe”]. However, it would be fitting to represent the Bree-hobbits and Bree-men as a single Culture: “Bree-folk” which share a set of Bree-specific cultural traits, but which have two separate builds depending on whether the character is one of the Big Folk or Little Folk. • High-elf (Noldo, or Deep Elf) from Lindon, from Rivendell, from Lorien, or from Aman. • Wood-elf (Nando Silvan Elf) from Lorien, from the Woodland Realm, from the Wandering Companies of Eriador, or from Aman (and after the War of the Ring: from Ithilien). These are the native elves of Eriador and of Rhovanion (along with the Penni Avari). The Wood Elves of Dol Amroth sailed to Aman. The language (to the extent it survives) is, or was, Leikvian (East-Danian), an Old Norse-flavored Elvish. In one place JRRT says the language is no longer spoken, but in another place he says that it is the main language of Thranduil’s Realm. So for diversity’s sake, it might as well still exist in the Woodland Realm. • Raft-elf of the Forest River – The easternmost community of the Woodland Realm. Could be represented as a distinct Culture, in a similar way that the Lake-men are distinct from the Dale-men, even though Esgaroth is part of the Kingdom of Dale. • Red-elf of the North Pole. Though depicted in the Father Christmas Letters, they are perhaps are already there in the late Third Age. They will not have “diminished” in size yet. Mannish cultures are reminiscent of 900-AD, except for those of Eriador (minus the Dunedain), which are 1897-era. • Bree-man [=1897-era Buckinghamshire]. However, it would be fitting to represent the Bree-hobbits and Bree-men as a single Culture: “Bree-folk” which share a set of Bree-specific cultural traits, but which have two separate builds depending on whether the character is one of the Big Folk or Little Folk. 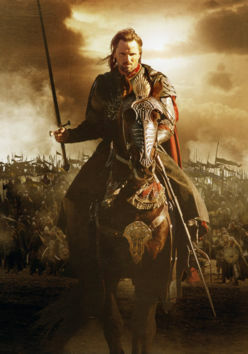 • Man of Gondor [=Byzantines]. The difference between High Men and other Gondorians is, by the late Third Age, of only slight distinction. • Man of the Balchoth of Southern Rhovanion [=Bulgars]. There are presumably also Balchoth in the Wide East, similar to the Volga Bulgars. • Man (or Easterling) of the Last Desert [=900 AD-era Mongols, pre-Genghis Khan]. The Last Desert is the Third Age corollary of the Gobi Desert. •The beings (Men? or otherwise) native to the countries mentioned in Bilbo’s poem “Errantry”, such as Thellamie and Fantasie. The “butterfly” he woos could be a sort of “Butterfly-Woman”…namely, a woman from the Middle-earth corollary of the Miao people of Southeast Asia, who view the Butterfly as their ancestral mother. Where is “Basements & Balrogs VII”?